on September 24, 2017 at the Riverwide Arts Music & Arts Festival in Emeline Park - 11-5pm. OPEN TO ALL. Adults/kids come out and paint a tile, which will be turned into an outdoor public tile mural in the Village of Haverstraw, NY. The Haverstraw Riverwide Arts & Music Festival welcomed community members (young and mature) on July 11, 2015 to become part of a public art tile project, in Emeline Park, Haverstraw during the Haverstraw Riverwide Arts & Music Festival. Each participant drew Striped Bass, turtles, Wood Ducks and animals found indigenous to the Hudson River. They chose their animals from a picture reference of a variety of Hudson River animals onto tile, then glazed to add color. Over 100 tiles were then fired over the summer of 2015. 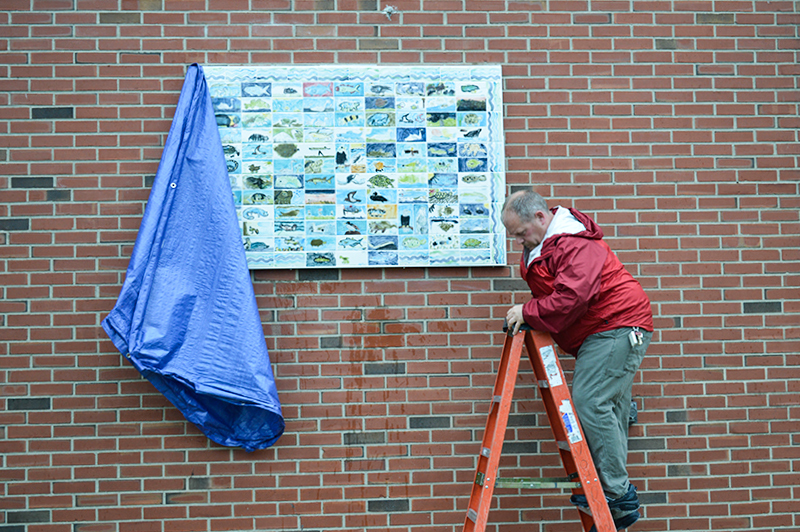 The public mural was unveiled on June 5th 2016 at 2:00pm, at 40 New Main Street, Haverstraw in front of Village Hall. Visit Village Hall to see its permanent home. On Sunday, June 4th, 2017, we will unveil The Community Tile Project #2 in front of Village Hall - 40 New Main St. Haverstraw. The theme for this project is SHIPS THAT HAVE SAILED THE HUDSON RIVER.